Things have changed since the last time I blogged about the Bronx Bombers. Monday things were looking good for the Yanks after they dominated their home opener. Now things are looking great, they are coming off a sweep of the Devil Rays and will face the St Louis Cardinals in a three game series this weekend in the Bronx. The Yankees are currently on a four game win streak and they looked good in all facets of the game. The Rotation has done its job by limiting the amount of runs given up and giving the offense a chance to win the game. The offense has been blooming late in every game, but a baseball game is a 9-inning marathon, not a quick sprint. The Bullpen and defense has also looked good throughout this winning streak. 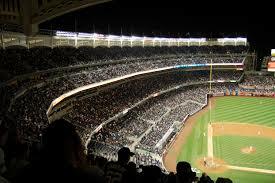 Looking forward to this weekend, there are a couple of big games for the Yankees, with tonight being the biggest. The Yankees have Masahiro Tanaka lined up for tonight, who needs to have a good game today. He will be making a very important start today, he has not been having a very good season. As I have said earlier, if the Yankees want to have any chances of making the postseason, Masahiro Tanaka will need to have a great season. Tanaka has struggled thus far this season and needs to be the ace of this team tonight and continue the winning streak. The Cardinals have not been playing great this season, so Tanaka’s pressure might be decreased just a little. The Cardinals are struggling right now, but they are simply not this bad. The Yankees need to continue stepping on opponents’ throats and make sure the Cardinals do not figure things out while they are still in the Bronx. The Yankees’ offense will be able to solve the rotation of the Cardinals. In the end, the Yankees will take two out of three in this series and will continue there momentum into next week. I have introduced the hot meter on social media. Be sure to follow along how hot the Yankees are after the game tonight. Like and follow.